WIZARDS RULE Gellert Grindelwald (Johnny Depp) makes his case to the wizarding world that they, not humans, should run the world. Anna Magizoologist Newt Scamander is back with his briefcase of creatures and ragtag group of do-gooders, this time traipsing through London and Paris instead of New York. After being blamed for the destruction in New York where the first film ended, Newt is confined to London by authorities. While he continues to beg for travel rights, he won't go so far as to become an Auror alongside his brother, Theseus (Callum Turner), when offered the position as trade for what he wants. If you haven't seen or don't clearly remember the first Fantastic Beasts film, this one jumps in at a pretty steep learning curve, and would be—I imagine—both confusing and probably boring as Crimes of Grindelwald seems to assume its audience is up to speed. The Harry Potter universe and its ever-expanding storyline make for some magically wild rides, and I was pretty entertained by the first film in this timeline. This rendition, however, didn't totally wow me. 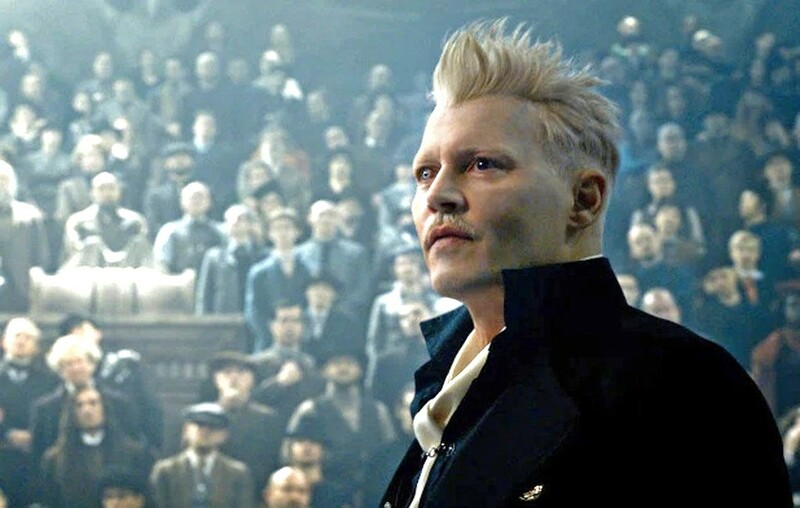 It is more focused on Grindelwald's (Depp) rise, a wizarding world pre-villain to Voldemort, one that we do somewhat get to know in the Harry Potter books because of his connection to Albus Dumbledore. Depp is an effective villain with shocking white hair and an interesting pair of eyes, but he fails to rise to the pure evil that Ralph Fiennes achieved in the first film series. I'm not too surprised—with the backstory of books read and reread, he certainly had a lot of character already created for him. Besides the end goal of capturing Grindelwald, there are plenty of side stories going on—Jacob (Dan Folger) and Queenie (Alison Sudol) are a couple of lovers, outlawed from becoming bride and groom because Jacob is a no-maj. Credence (Ezra Miller) is in search of his birth mother and family history, tortured and tormented by his time with Mrs. Barebones. Newt still holds a candle for Tina (Katherine Watson); creatures are escaping from his case; and the world is in peril once more. This one has a lot going on. Glen Thanks for explaining it for me, because I didn't know what the hell was going on during the first 30 minutes or so, and I was bored enough to doze off a few times in Downtown Centre's crazy-comfortable recliners. I saw the first Fantastic Beasts but didn't really remember the characters, which added to my confusion. I recently saw that the first film is currently available at Redbox. Maybe I should have done my homework. This new film does improve as it goes along, and the last third was pretty exciting as Grindelwald holds court with the wizarding world, trying to convince them they should run the world rather than let the no-maj or muggles or—good grief, does J.K. Rowling get paid extra for making up new words? Anyway, everything coalesces at the end into a big showdown between Grindelwald, Newt and his friends, and Theseus and his Ministry of Magic cohorts. The only one missing is Dumbledore, who through flashback we discover had a special relationship with Grindelwald in their youth. I couldn't help but wonder if there was some gay subtext here, but it's not made clear. What this film really does is place all the pieces and players on the field of battle to tee up the next three installments, all to be directed by Yates, and scheduled for release in 2020, 2022, and 2024. I saw the Harry Potter series and thought it was pretty good, mainly because I liked the friendship between the three main characters, and it was amazing watching them grow up into young adults over the course of the many films. This series doesn't have the same depth, charm, or novelty. I may very well exit the Fantastic Beasts series right here. DO YOU BELIEVE IN MAGIC? 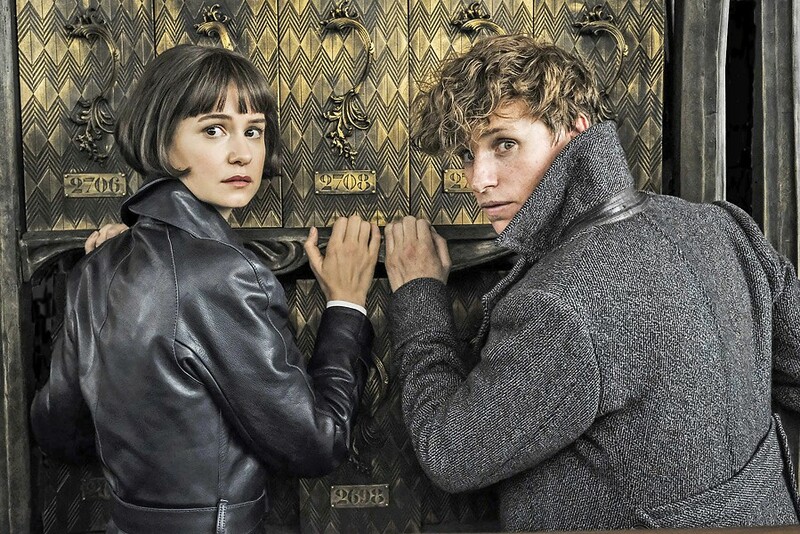 Tina Goldstein (Katherine Waterson, left) and Magizoologist Newt Scamander (Eddie Redmayne) team up to battle evil wizard Gellert Grindelwald. Anna I'm a Potterhead, no doubt. I've got a wand, and I happily craft Harry Potter themed projects. I've read the books countless times. I'll watch any of the movies if they are on cable, and own all of them if they aren't, but I need a fix. I get that this world can be a little mystifying for some, especially if you weren't in the right age group when the books came out. The complexity of the world Rowling has built is not without fault, though for the vastness it contains I'm pretty impressed with her consistency. I agree that the beginning of the film was a bit of a slog, and if you aren't head over heels for new content in this universe, Crimes of Grindelwald may well be a waste of your time. At two hours and 15 minutes, this isn't a quick trip into the land of magic. Some of the reveals are also less surprising if you're pretty familiar with the books. I knew of Grindelwald and Dumbledore's connection from long ago, which means some of that aha moment is lost. However, there are moments in there that seem pretty catered to die-hard fans—seeing alchemist Nicholas Flamel put a smile on my face. It is decidedly my least favorite film in the Harry Potter universe, and in my opinion falls quite short of its predecessor Fantastic Beasts and Where to Find Them. However, would I see it in theaters despite all that? Heck yes! My own blood oath to Rowling's work requires it. Potterheads, I recommend you hit a matinee of this one. Casual fans have no reason to spend extra; just wait for it to be available at home.